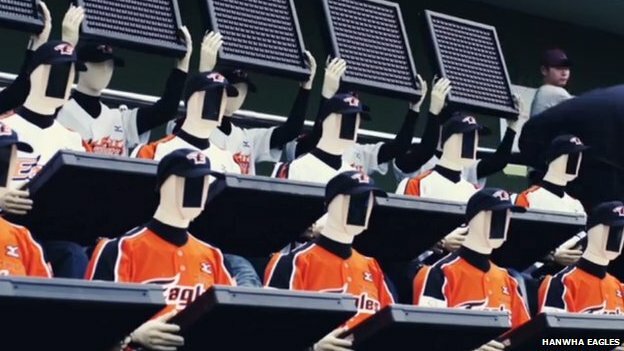 A struggling Korean baseball team have invented a novel way to improve atmosphere at their matches - by bringing in a crowd of robot fans. The bots can cheer, chant and perform a Mexican wave - but presumably not invade the pitch. One expert said giving more fans a chance to "attend" was important for professional clubs. "If you look at all the big clubs, you can't just get a season ticket - you have to sit on a waiting list. "What happens if a robotic fan misbehaves?" he joked. "Gets aggressive, abusive, spills a drink... I can see it being fraught with danger. What if it sits in the wrong section? 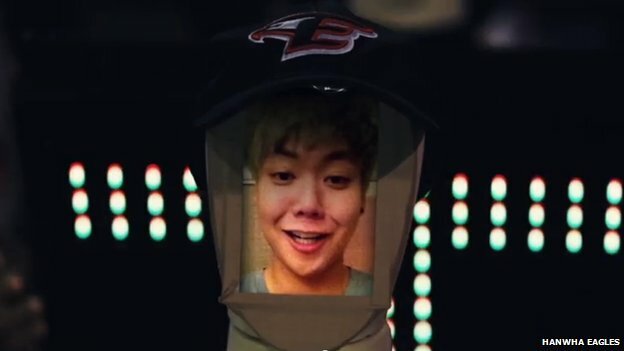 A robotic hooligan!" It is not easy being a Hanwha Eagles fan. In the past five years, they have suffered more than 400 losses - so many that fans of the team are regarded with a degree of sympathy, and have earned the nickname Buddhist Saints. As part of Japan's unsuccessful bid for the 2022 World Cup, the country said it hoped to re-create live matches using holographic technology in other locations. It would mean, in theory, that several stadiums full of fans could be watching the same match at once. Independent experts were sceptical the virtual reality plan could have ever worked - but praised the ambition. "Within a short amount of time, nearly every Premier League stadium will have wi-fi," said Mr Cutler. "Everyone's got a phone with them, checking other things. The days have gone where people are completely engrossed in the match."